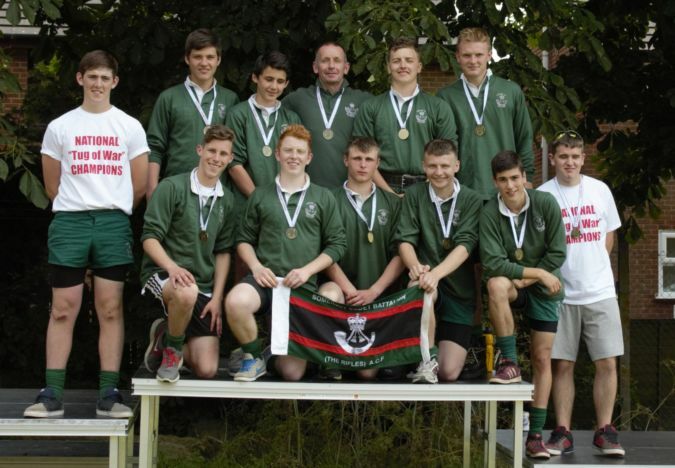 On Saturday 21 June 2014 four Army Cadet teams from across the country battled it out for the English National Tug-of-War Championship title in a competition held in Lincoln. The four teams from Somerset, Gloucestershire, Derbyshire and Leicestershire, Northamptonshire and Rutland all had to qualify by taking part in all six national league events in Manchester, Daventry, Sandhurst, Felton, Lincoln & Safford before entry to the championship tournament. Once at the championships the teams had to pull the best of two ends against each other in a league, gaining 1-point for a draw and 2-points for a win. The top two teams going on to the final. Somerset ACF, consisting of nine cadets from Yeovil and two cadets from Wells, won in both the 560kg Junior Male and 530kg Junior Male categories. Two female cadets also helped Gloucestershire ACF to secure gold in the female competition, Kelly Kirkby aged 18 from Bridgwater and Chloe Lawrence aged 16 from Yeovil. Somerset ACF team manager and coach, Lt Tim Tatler, was very proud of the teams, “They’ve put a great deal of work, commitment and discipline into their preparation and training, all on top of their normal cadet training and it has obviously paid off. We now go on to represent England at the UK Championships in Belfast on 1 - 2 August 2014." Back row – Lloyd Price, Yeovil; Connor Barrow, Yeovil; Alfie Gillmon, Yeovil; Lt Tim Tatler; Josh Williams, Yeovil; George Worle, Wells. Front row – Liam Macmenemey, Yeovil; Sam Palmer, Yeovil; Rickie Dalley, Yeovil; Dion Court, Yeovil; Lewis Nightingale, Wells; Charlie Welsh, Yeovil.